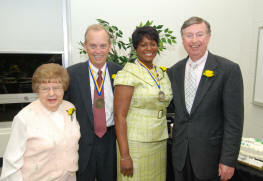 DCC’s alumni operation began in the summer of 2006 as an initiative by Dr. Carlyle Ramsey, DCC president, and the DCC Foundation to fully establish an alumni organization in a manner that would create a functioning entity as officers and committee memberships changed over the years. Funding for a full-time Alumni Coordinator was not available, but a part-time coordinator was hired to begin the process of establishing guidelines, contacting alumni, helping launch an alumni web site, establishing an Alumni Board and creating a legal framework, so an eventual alumni organization could be self-sustaining. The first part of the initiative was to find the alumni. How did DCC officials find alumni? For Danville Community College, electronic data was available on all students from 1984 to the present. That was an easy find and easily transmittable from the technology professionals within hours. But previous to 1984, data on individuals was in printed and handwritten form in folders in a vault in the admissions office. That data was on thick cards that would not automatically feed through a copy machine. That data was very fragile, meaning it had to be hand processed for each individual. Along with expanding manila folders, there were boxes of files on Danville Technical Institute graduates with more fragile data inside. Beyond the problem of fragile files, all information on VPI-Danville graduates was mixed with all graduates from the Blacksburg campus. No method has yet been found to extract their files, so DCC alumni officials continue to seek VPI-Danville graduates—one person at a time. Thus began a long process of transferring data from cards to photocopies, data which would then be transmitted to a company in Chesapeake, Virginia, hired to research national records for up-to-date alumni addresses. Movement of boxes from the vault to a photocopy machine upstairs in Wyatt Building continued unabated for almost six months. Slowly the count emerged. DCC’s alumni, comprised of anyone who passed a credit class, exceeded the 48,000 mark rapidly. Within months, a figure of 78,000 became the more likely number and even that is not a final count, since DCC is continuing to seek the VPI-Danville alumni. There is the possibility of 6,000 more alumni among the VPI-Danville graduates. Upon launch of the alumni website, Alumni Relations at DCC had worked over a year establishing the possible alumni numbers, submitting information and seeking alumni. Click here to view the By-Laws of the DCC Alumni Association. 2013 Outstanding Alumni - Anita Wyatt honoree for DTI and DCC, Stephen Worley, honoree for DCC, Dr. Leisa Banks, honoree for DCC, and Rodney Reynolds, honoree for VPI-Danville Extension.